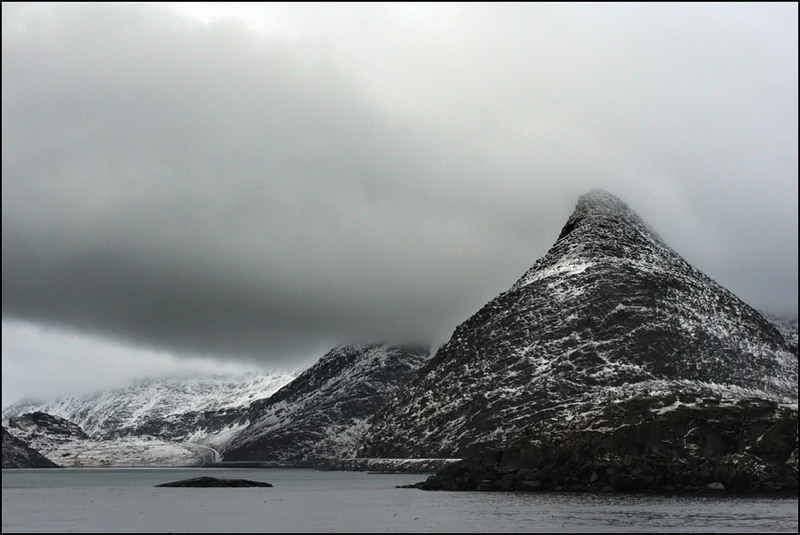 Two weeks ago, I took a mini “cruise” from Tromsø to Kirkenes and back, on board the MS Lofoten. The Hurtigruten company runs ships from Bergen to Kirkenes and back, with one ship leaving Bergen every day (total journey time for the round trip is 11 days). They stop in Tromsø both ways, and this means the Hurtigruten becomes a part of daily life in a way. For example, it blows its horn loudly every time it arrives in the afternoon and you can hear it from nearly everywhere in town. When I hear that, I know it’s 14:30 and I can sometimes even recognize which ship is coming in 😀 It stays for 4 hours and it’s quite easy to recognize tourists from the ship when you’re in the town centre 😉 The southbound one comes in just before midnight and doesn’t stay very long, but if I work the night shift it passes the south tip of the island just when I am on the roof to observe, and I love watching the ship (all lit up) sail into the dark night. Anyway… I found out they had a special discount on tickets between Kirkenes and Tromsø. 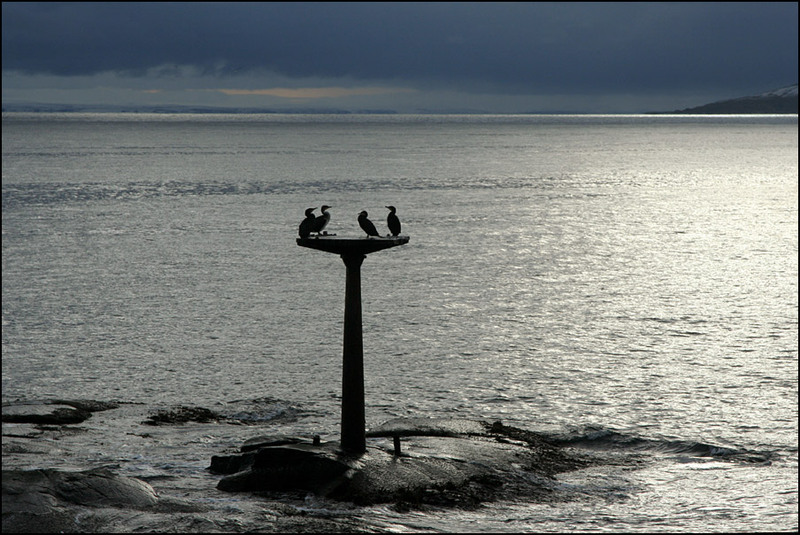 It’s a part of Norway that I don’t know very well, and was curious to see. It would also be good for work, as this is one of the areas we write forecasts for – much easier when you have some local knowledge 🙂 Paul couldn’t come because of work, he wasn’t very keen either after nearly a month at sea in September :D. So on a rainy Saturday evening, I boarded the MS Lofoten on my own. Below is a photo of the ship, and a map of the route it took. I knew it was risky taking this trip in October, and indeed I didn’t have very nice weather. 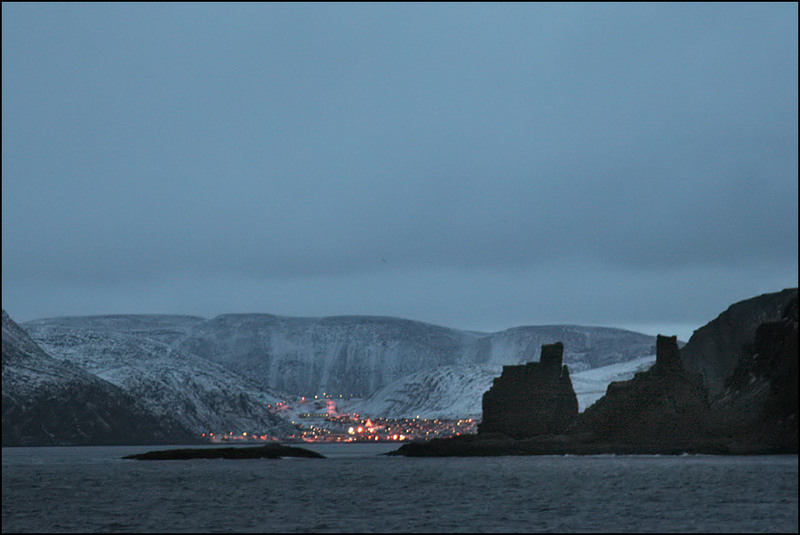 The ship left Tromsø in the dark, and by the time I got up the next morning, we had just left Hammerfest. 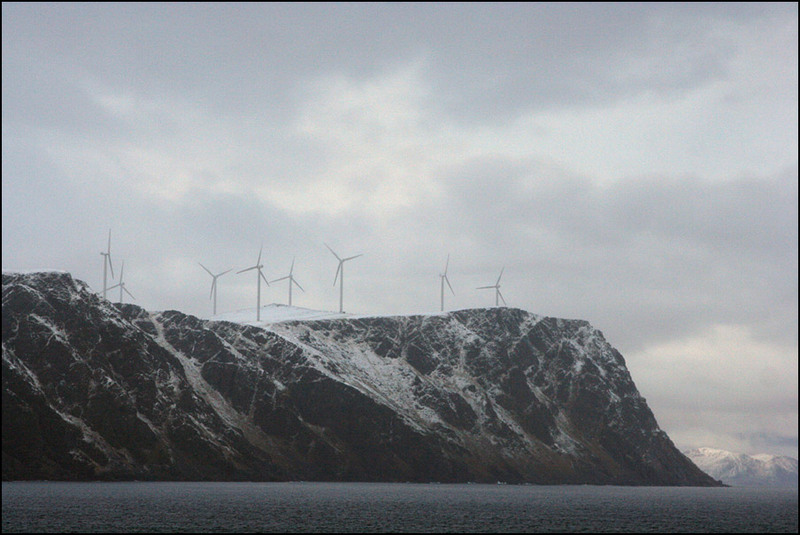 I spent some time on deck looking at the landscape, discovering how many shades of grey exist 😀 Grey sky, grey mountains, grey(ish) snow, grey wind turbines… Still, the landscapes were quite impressive! 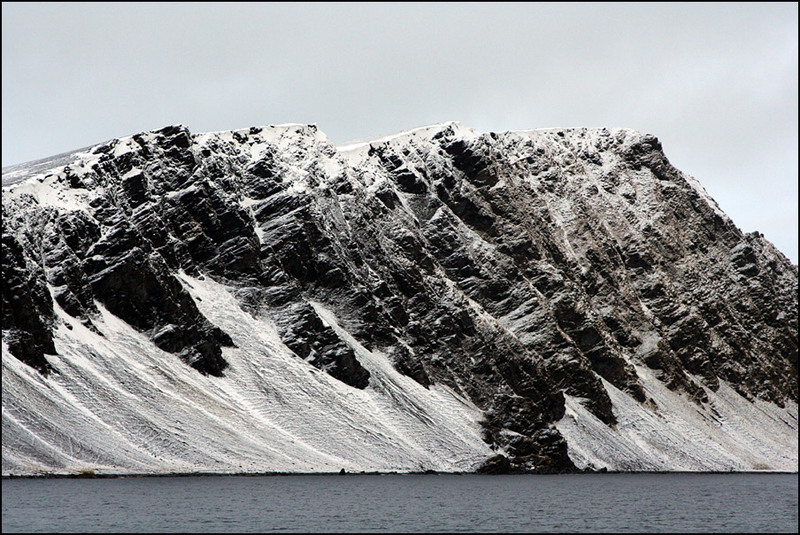 This part of Norway is called Finnmark. 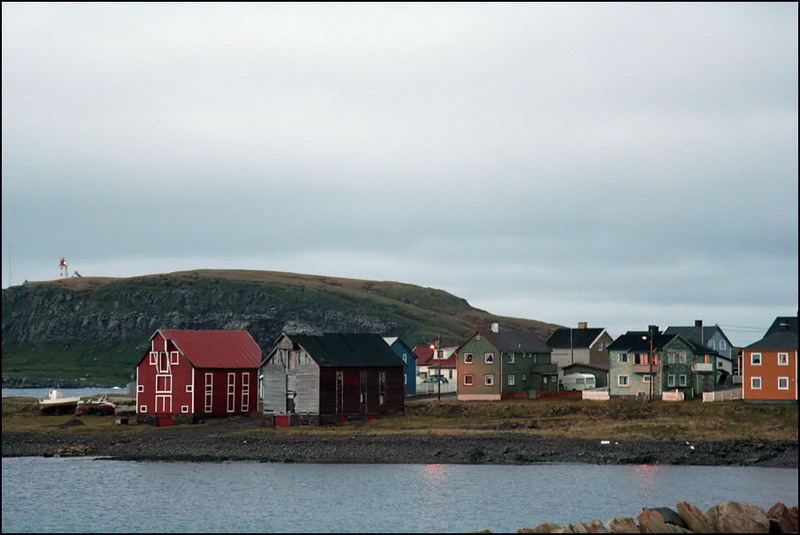 It’s bigger than the Netherlands – but has a population of only 72,000 people. I did know this, but it’s hard to imagine such a big area with so few people in it. 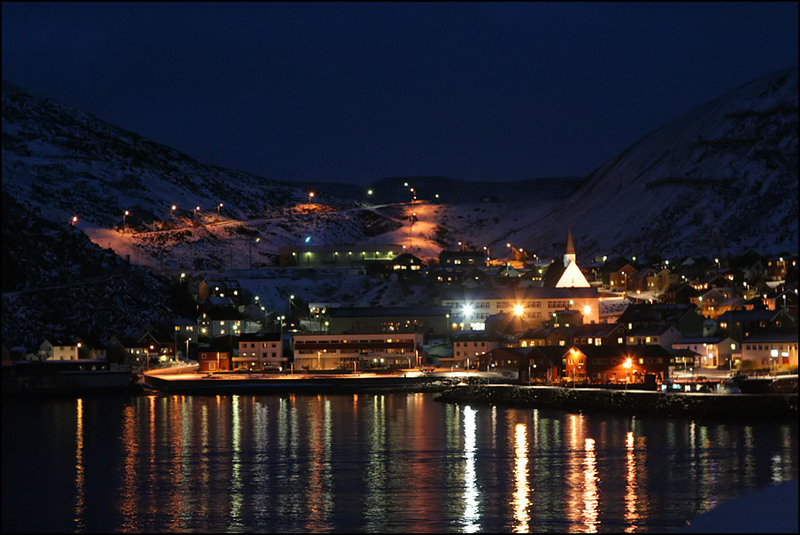 I never realised just how small all the towns in Finnmark are… honestly, I don’t think I could live there, much too isolated. 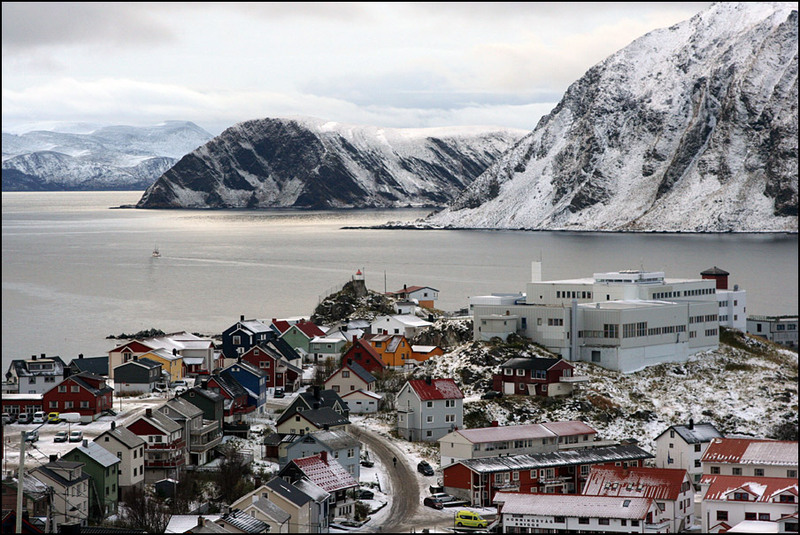 Tromsø has 67,000 people and I already wish it was bigger sometimes 😛 The ship visits all “major” towns/villages along the coast, some of which are tiny – like Havøysund in the first photo below – only about 1100 people live there. 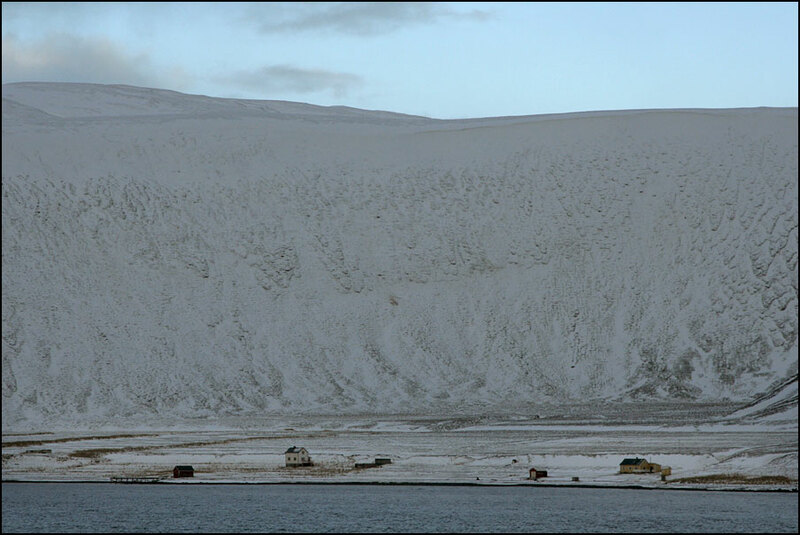 In those small places, the ship only stops for 15 minutes, to deliver cargo or receive goods, and people can get on and off as well. The Hurtigruten was originally set up as a postal service, and it obviously still hasn’t lost this function completely – of course it doesn’t take the actual mail anymore (that’s taken over by planes), but it does deliver a lot of bulkier things like building materials and car tires :D. It makes the Hurtigruten a mix of partly ferry, partly cargo ship, partly cruise ship. Lots of tourists do the full 11 day trip, or at least one way. Locals use it more as a ferry, often getting off at the next stop. I quite like this mix, I don’t think I would enjoy a “proper” cruise. 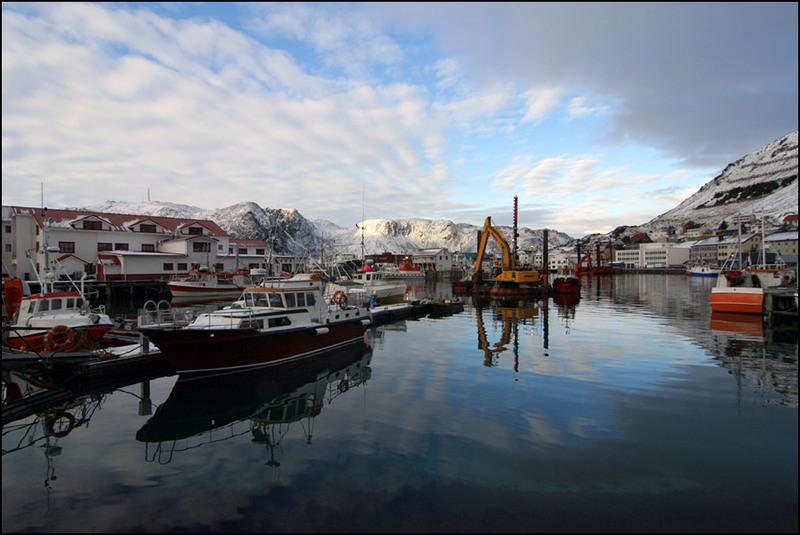 Just before noon, we arrived in Honningsvåg, and the sun came out – what a nice surprise! 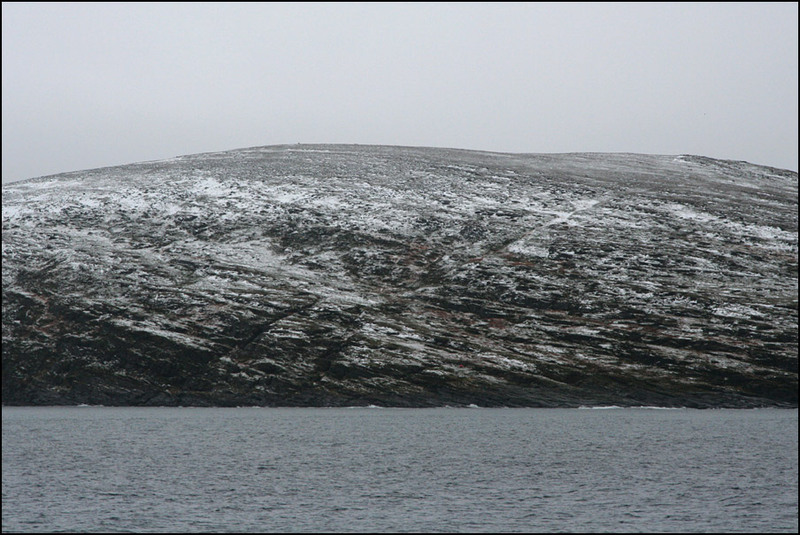 This was one of the longer stops (3.5 hours), mainly because they organize an excursion to the North Cape from here. 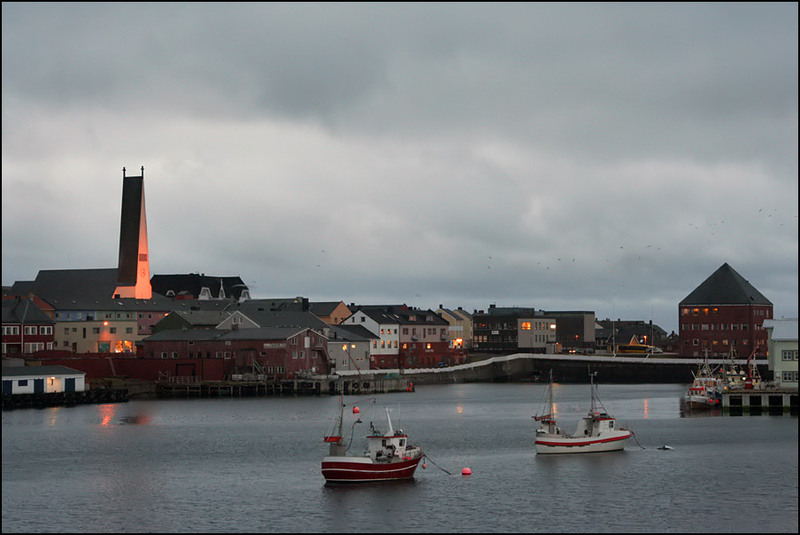 I was more interested in seeing Honningsvåg itself, so I skipped the (expensive) excursion and walked around town. It was Sunday and very quiet. I enjoyed walking around the docks, and I even met this cute little creature running around the shore. 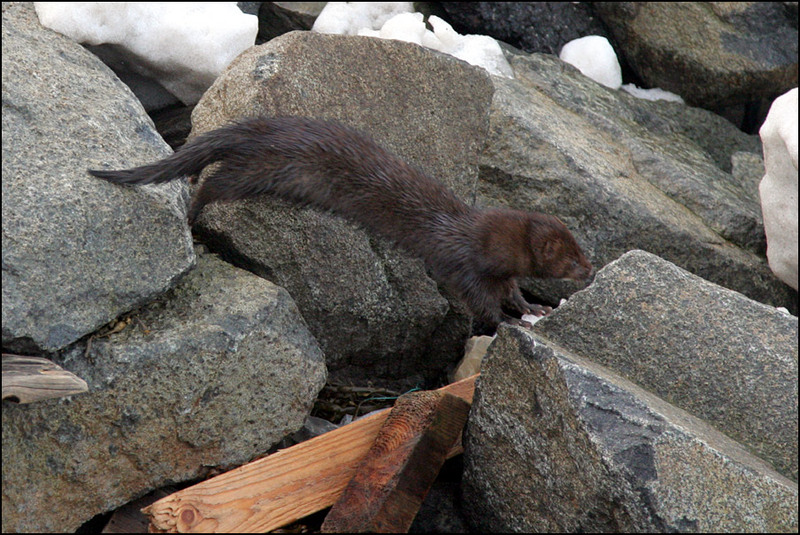 I first thought it was an otter (though it was much smaller than the ones I’ve seen before), but after looking it up, it must have been a mink. 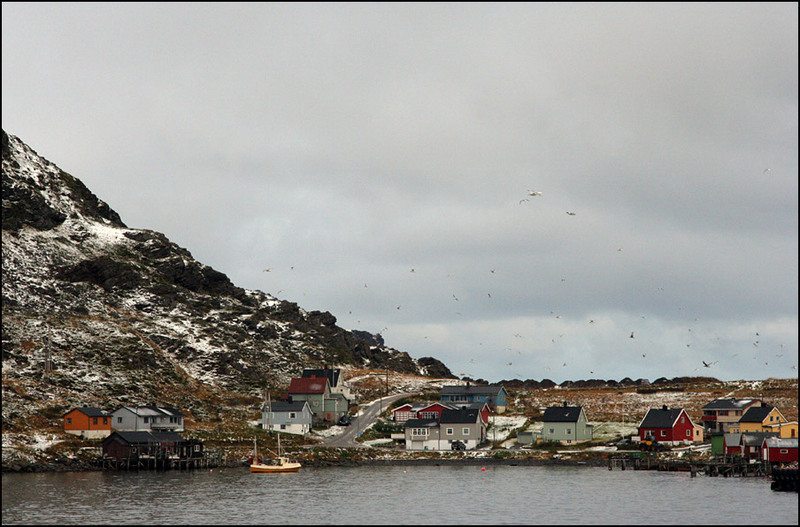 We left Honningsvåg at 15:15, and our next stop was Kjøllefjord at 17:30. 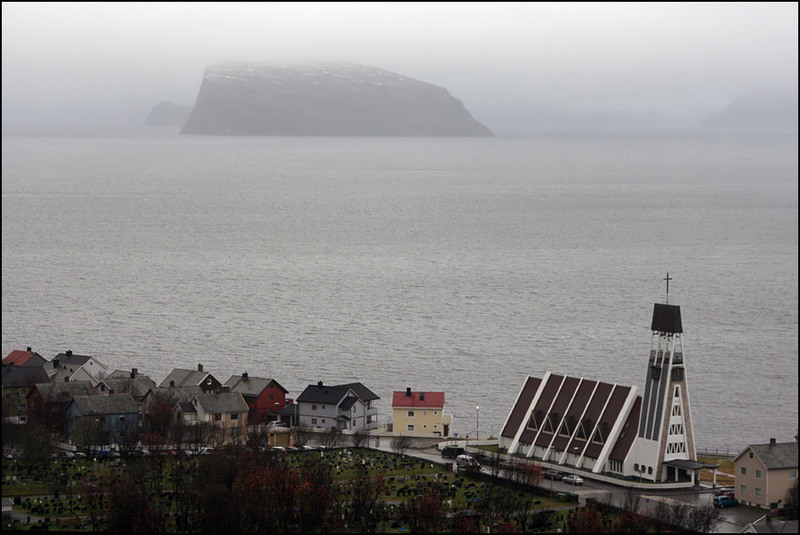 It was almost dark by the time we got there, but we were just about able to see the impressive rock formation called “Finnkirka”, shaped in the form of a church. The day after I came back from my cruise, they installed flood lights on the formation, pity I didn’t get to see that. 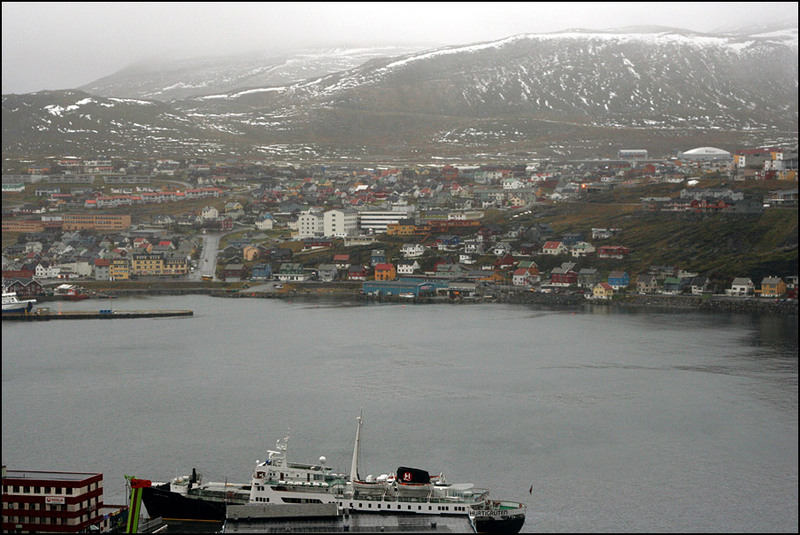 The next morning we stopped in Hammerfest for 1.5 hours. 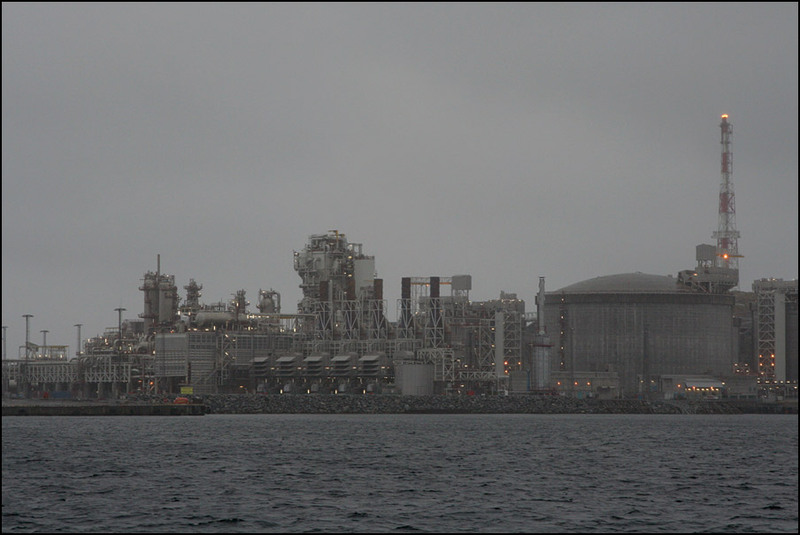 First we passed the Snøhvit project on the island of Melkøya – an enormous installation that collects natural gas from the Barents Sea. 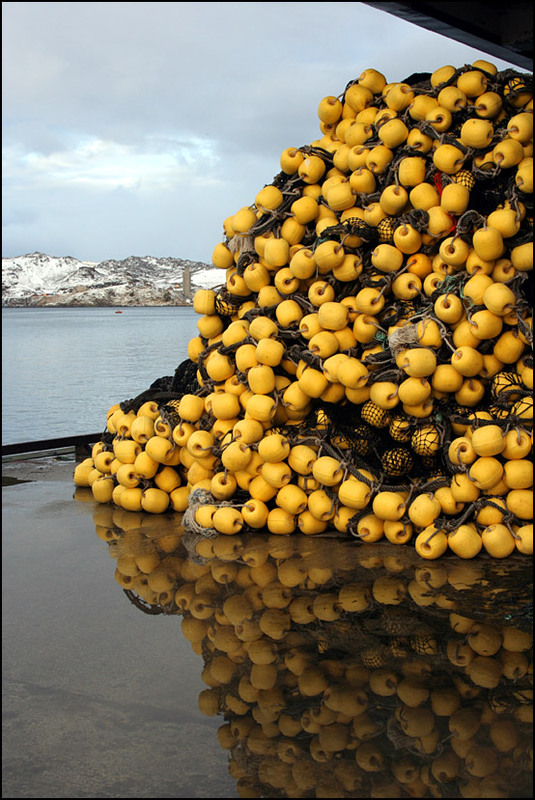 Hammerfest is very proud of this installation, and no doubt it created a lot of jobs and money… They claim it’s environment-friendly… I guess that depends how you look at it! 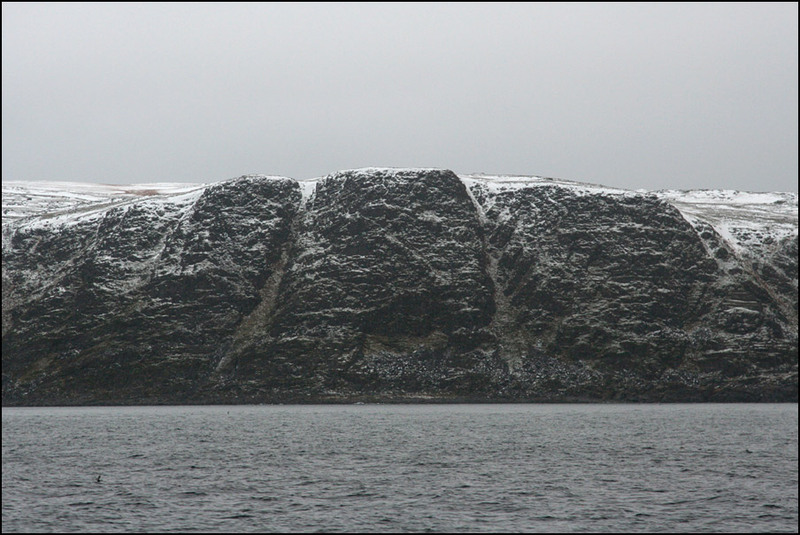 I thought Hammerfest would be one of the highlights of the cruise, but I didn’t really like it. I guess the bad weather didn’t help much, and the entire city centre seemed to be under construction (with the main street turned into a muddy mess). It’s also a strange mix of modern and more traditional buildings. 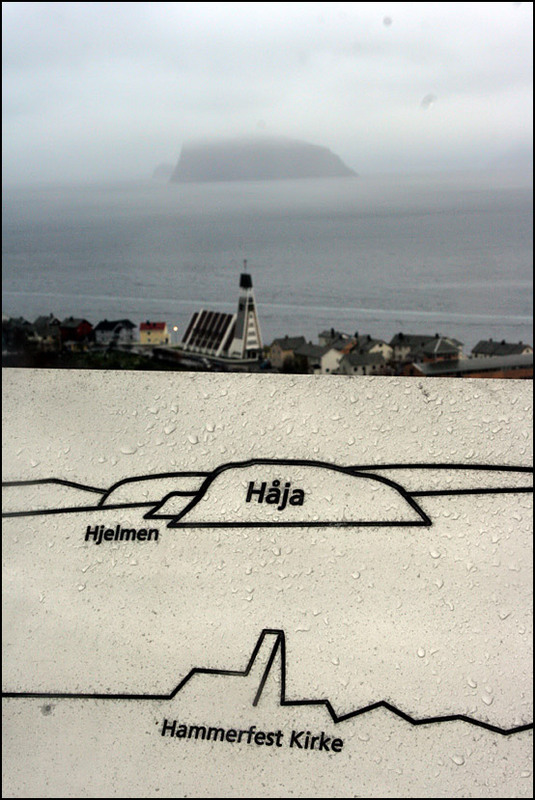 None of the buildings are very old though -Hammerfest was completely destroyed at the end of WWII. Good article about Hurtigruten. 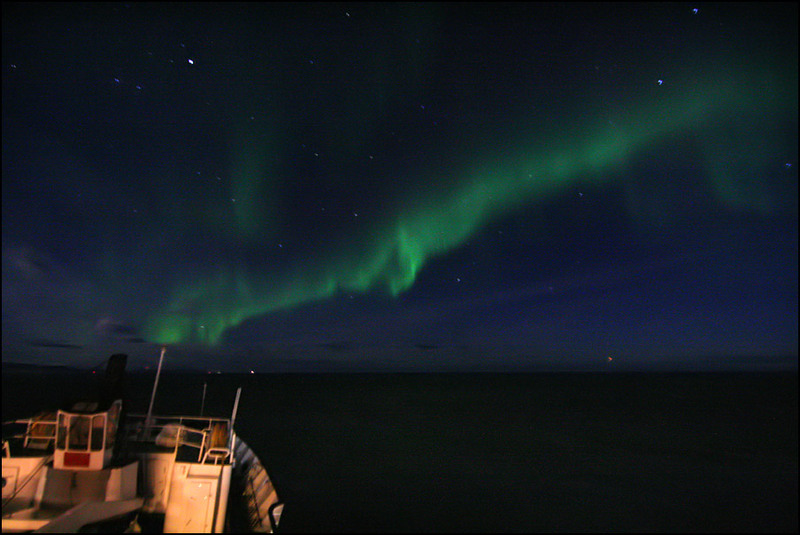 I’ve travelled with them a couple of times, although I’ve travelled on the newer ships not the Lofoten. 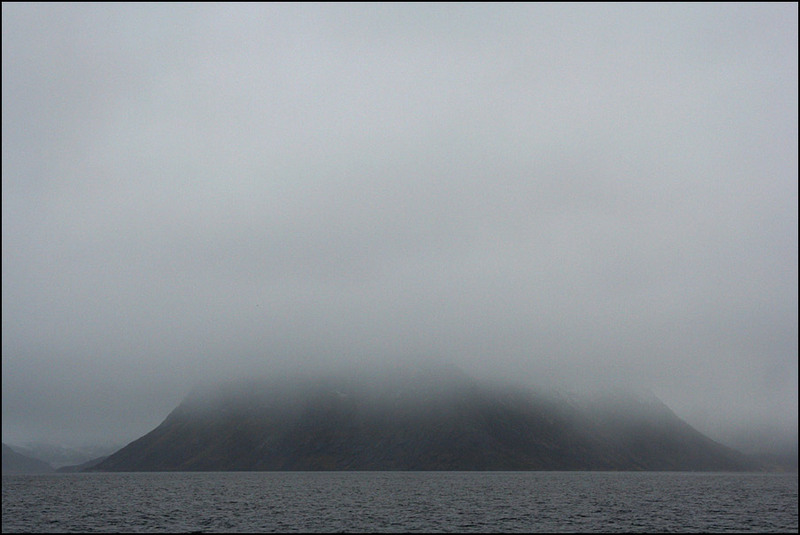 I think whatever ship you choose, it’s a great way to see the superb scenery of the Norway coastline. It is indeed! 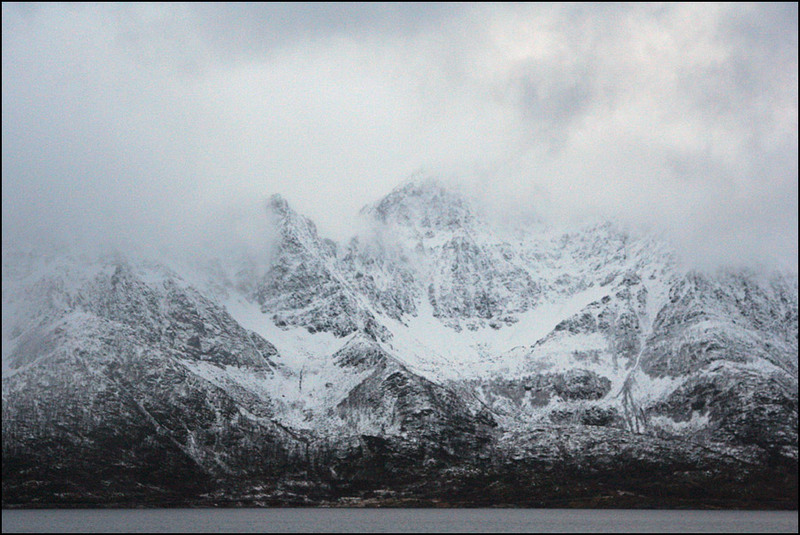 Now I would like to do the other part of the trip too, Tromsø – Bergen – must be so pretty crossing the Lofoten. Perhaps I’ll try the other old ship, they do have a special atmosphere 🙂 I think I’d be a bit overwhelmed by the newer ones, some are so big! Hope you can make the trip one day! They have interesting offers sometimes, especially off season. I didn’t pay very much for my ticket at all, about 2000 NOK in total for 3 nights in a single cabin, including breakfast. 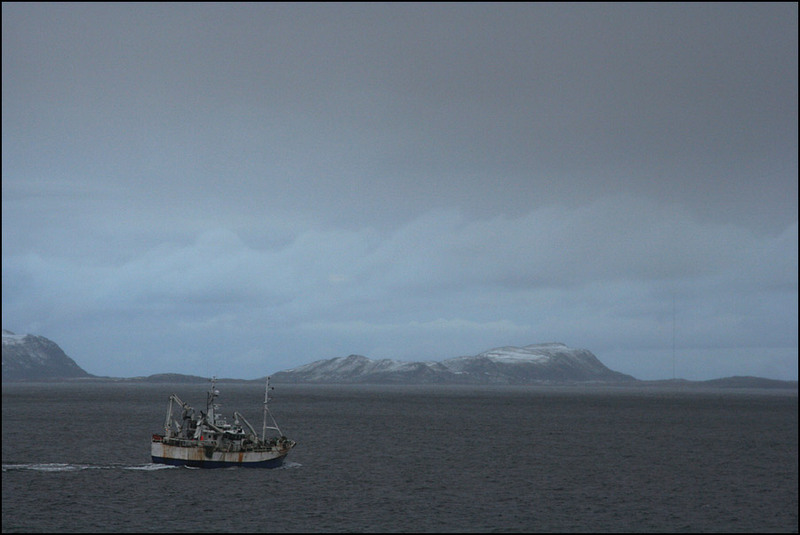 What a great blog – I am thinking of travelling from Tromso to Kirkenes on the MS Lofoten – did the sea become rough at any point? Was the boat rocking much?! Thank you! 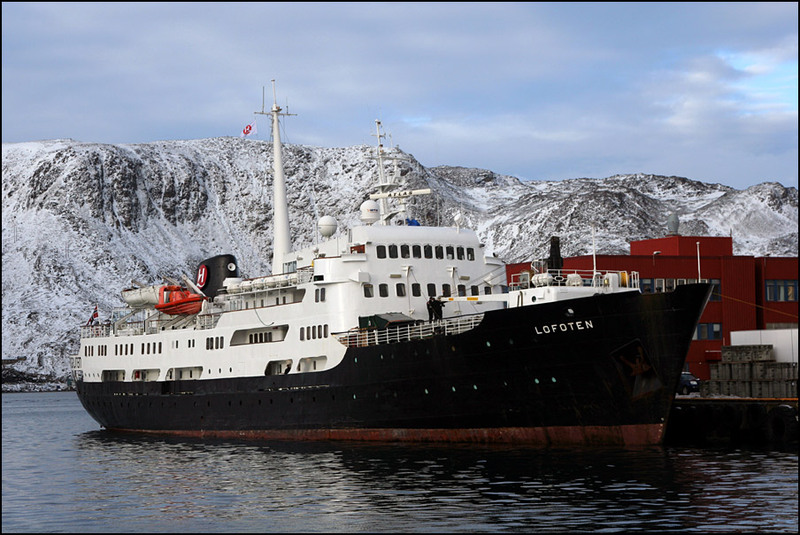 The MS Lofoten is a wonderful ship, I’m sure you’ll enjoy the trip. My trip was very calm, not much rocking at all. Except on the way back when we passed Loppa, a notoriously windy place. Suddenly the waves were big, things were falling over and dinner had to be postponed. It didn’t last more than about 30-45 minutes though, then it was calm again. Of course it depends a lot on the weather, in general it will be much calmer in summer and more windy in autumn and winter. I think we’re actually going to be on the MS Finnmarken as our dates have changed – so I hope on a bigger boat it’d be less choppy! 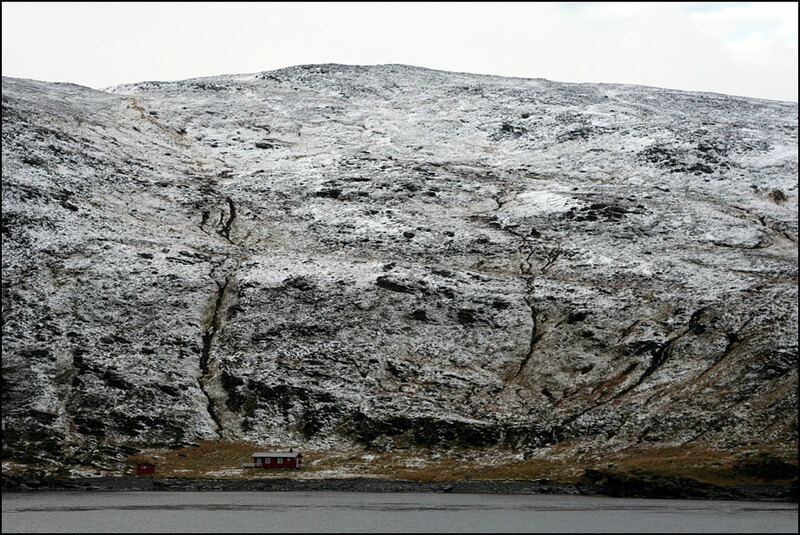 Does the boat not pass by Loppa on the way from Tromso to Kirkenes? 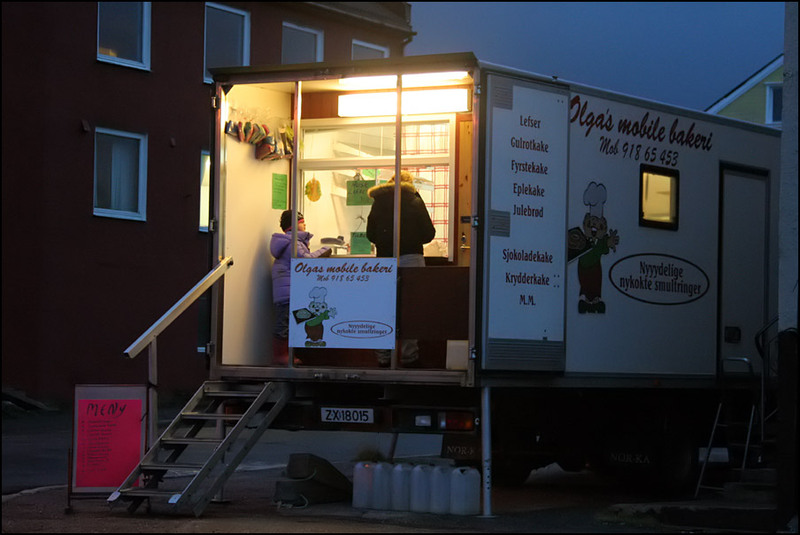 A great blog, Hanneke. We did a round-trip voyage with my father to celebrate his 85th birthday, and it was indeed an amazing experience. Because of the mixed nature of the passengers, even the new larger ships have a really friendly atmosphere.